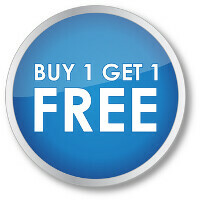 Just yesterday, we told you about a rumor that Microsoft was about to offer a BOGO deal. More precisely, the speculation called for a consumer to purchase the Microsoft Lumia 950 XL and receive the Microsoft Lumia 950 for free. Sure enough, the deal is now official and is available from the online Microsoft Store in the U.S. and Canada. The software giant was hoping to cut its increasing inventories of unsold Lumia handsets by offering this deal. The BOGO covers unlocked models only. 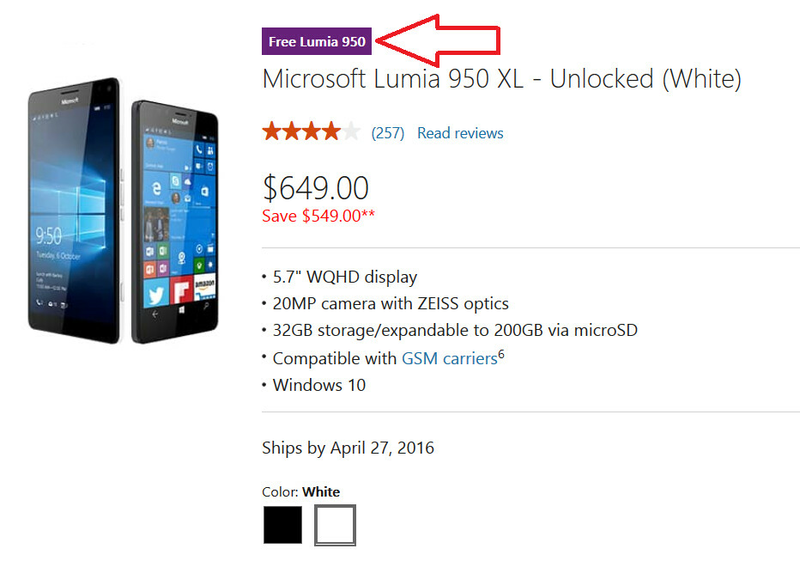 The free Lumia 950 comes only in black, and the deal is good while supplies last. If you are a student, your 10% discount is still valid and is subtracted from the price of the 950 XL. For those Windows 10 Mobile fans (and we know you do exist) who have been waiting for a spectacular deal to pick up the Lumia 950 XL, this is it. The 950 XL features a 5.7-inch AMOLED display with a 1440 x 2560 resolution. Under the hood you'll find the Snapdragon 810 SoC equipped with an octa-core 2GHz CPU, and the Adreno 430 GPU. 3GB of RAM is inside along with 32GB of expandable storage. The rear-facing camera is a 20MP snapper with an aperture of f/1.9, and OIS. Those who like to shoot selfies have a 5MP front-facing camera that can be employed. A 3340mAh battery keeps the lights on. The Lumia 950 has a smaller 5.2-inch display (still 1440 x 2560 resolution). The Snapdragon 808 is under the hood with a hexa-core 1.8GHz CPU and the Adreno 418 GPU. A 3000mAh battery powers the device. Most of the other specs including the cameras, RAM, native storage, and microSD capabilities (200GB) are the same as those found on the Lumia 950 XL. Tough choice with 14328 being such an awesome update. Haha oh the Ironie...good deal though! The phone's fugly as hell but it's got the hardware for Windows 10. Slap a case on it the way you turn out the lights on an ugly broad and you're good to go. Ain't no shame in it. Damn, I'm super-tempted to pull the trigger on this deal. It is sweet! But you're right, with the 14328 update being so good on my Lumia 640xl, it is a tough choice. "can't even handle future software"?? The 950xl is running with the same computer as the Nexus you just mentioned. Windows mobile needs less computing power to run smooth then Android does. Yes but you get nothing with that OS. It runs smooth because it isn't runing anything. What I mean by future software is that Windows will leave you behind like they did the 1020 and 920 phones. You won't be able to run new Windows software on that device unless you do some buggy developer preview. The pit crews are using 950xl's! WOW - I'm a huge F1 fan but didn't know that little factoid. +1 bro. http://www.windowscentral.com/sites/wpcentral.com/files/styles/larger/public/field/image/2016/04/ferrari.jpg?itok=41GXzi8d Yup pretty neat, they don't even advertise that they use the device in such a way. Heck I don't even think MS is a sticker on the car. Most people just can't use WP. Most people will not use it is actually the big problem. When you buy this phone you will get stuck with it's current OS. Once windows revamps Windows for phones again you will get stuck with a phone with outdated software. Usable OS > Iris Scanner. No one uses Continuum. That's the reason they are having this sale. I had WP for a long time. They have moved way too slow in the last 4 years. Are you supposed to use some gimicky device while MS get's their s**t together? Just use an Android until a real Surface phone comes out. Just ordered for the deal. I have no intention of using the phone but I see no reason to pass up the chance to make a quick turn around. Good luck with that buddy. Hope you make some cash. Gotta be quick and hope people actually buy it online through ebay or Amazon by itself. Over $700 after factoring tax...... There's really no money to be made from selling when you look at what they're going for on Swappa. I don't think hell make money. Hell be stuck with both those cameras. Good thing they have a return policy of 30 days if they don't sell by then. Yeah I don't have a mentality like that. sorry. Pre-install android OS, and then ill buy. Sounds like a true attempt to move stock. W10's launch was ..ummm.. not great? I am such a glutton for punishment, so I believe in it long term. I truly do. It may be the new Enterprise first option, but there is so much potential with this OS. But this launch was a wash, and these two devices were not well received. MS has done a nice job improving W10 mobile, but it is so hard to get momentum once it has been denied. VERY VERY few people buy their phones sight unseen off the internet. It was the problem for the Dell Venue, its the problem for LOTs of Phones.. Want to sell the phone ?? THE SELL THE PHONE.. !! Here is a novel concept.. put the phone in the Microsoft stores at all the Best Buys in the country, you know where the customers are and where they have invested into making stores, and having sales people to promote their product.. I know, stupid idea right ? Every Best Buy in Miami has the 950 on display. Not in the phone area, in the Microsoft section just as you suggested. Get this, they have the Continuum dock connected but every time I see a dumbass reach for the phone they unplug it. You can't fix stupid. I've seen that as well, but to be fair that's the AT&T model. It would make more sense if they would also offer the unlocked versions at the store, especially with Best Buys' financing options.